Tonight, district baseball and softball continues in the area and we have our first Crosstown showdown of the spring and the North Lamar Pantherettes will travel across town to face Paris High in softball. In other softball action, the Prairiland Lady Patriots will host Cooper. Rivercrest is at North Hopkins, while Honey Grove hosts Sam Rayburn, and Detroit hosts Sulphur Bluff. In baseball tonight, the North Lamar Panthers will travel to Pleasant Grove. Chisum will travel to Commerce. 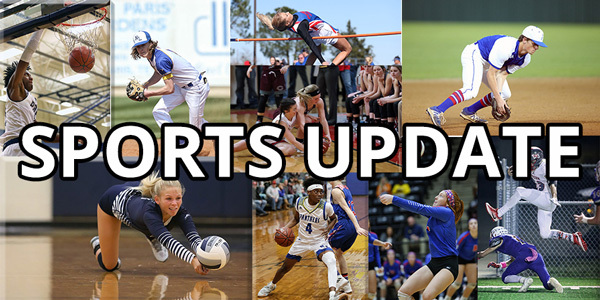 Prairiland will be at Mt Vernon, Cooper hosts Chapel Hill, and Honey Grove travels to Celeste. Last night on Fox Sports Southwest, Dirk Nowitzki made history. Dirk now has 31,419 points in his career. Despite the milestone, the Mavs fell to New Orleans in OT 129–125. Luka Doncic had his fifth triple-double of the season as he finished with 29 points 13 rebounds and 10 assists. March Madness begins tonight with the first of what they call “The First Four.” At 5:40 pm Fairleigh-Dickinson will face Prarieview A&M. Then at 8:10 pm, Belmont will take on Temple. Both games will be on TRU TV. Then, tomorrow night at 5:40 pm, North Carolina Central will take on North Dakota State. And, at 8:10 pm will be Arizona against St Johns. Again, both games will be on TRU TV. By the way, through bookies and brackets, nearly one in five adults in the U.S. will have a bet on the NCAA tournament, according to an American Gaming Association (AGA) survey. Forty million Americans will combine to fill out 149 million brackets this week, and 18 million adults will bet on the tournament with a bookmaker. The Cincinnati Bengals have released outside linebacker Vontaze Burfict. Burfict, 28, has missed 18 games over the past three seasons and wasn’t considered a lock to return to the team despite signing a three-year extension worth more than $38 million before the 2017 season. He has been with the Bengals for seven seasons. He was suspended by the NFL to start the 2016, 2017 and 2018 seasons and has found himself in the league’s doghouse several times for his style of play. Haloti Ngata, one of the most dominant defensive linemen of his era, scaled new heights to announce his retirement. In an Instagram post, Ngata stood on top of Mount Kilimanjaro, the world’s tallest free-standing mountain, with a banner that read, “I’m retiring from the NFL on top.” Ngata, 35, went to the Pro Bowl five times and won a Super Bowl with the Baltimore Ravens in February 2013. Selected No. 12 overall by the Ravens in 2006, Ngata established himself as a force inside with his size, power and athleticism. Despite his struggles at the plate that have followed him to Japan, the Oakland A’s says Ichiro Suzuki will be in the lineup for the start of the MLB season Wednesday in Tokyo. Ichiro was hitting .080 in spring training and went hitless in six at-bats in two exhibition games against the Yomiuri Giants. The Seattle Mariners play the Oakland A’s Wednesday to kick off the season.